After many trials and errors over the years, I've finally developed my own version of her sugar cookies. And you know, it's pretty close to the recipe I grew up on. She did use vanilla extract in her cookies, but I love almond extract way too much to change my ways. Hers also weren't frosted but they did have something on there. I'm still not 100% certain what she put on top of those cookies, but it may have simply been a brush of a beaten egg with tons of sugar sprinkled on top. I may give that a try some day, but I actually like them plain. Well, they're also good frosted, but au natural is just refreshing. The first finished recipe came about last summer. My son and I were in a baking mood so we whipped up some cookies in the shapes of letters and numbers. They were so fun to make and really fun for him to eat. The next time we made them was for Christmas. And since it was Christmas-time, he really wanted to make a Santa. And a stocking, and snowflake, and a candy cane, and, well, you get the picture. 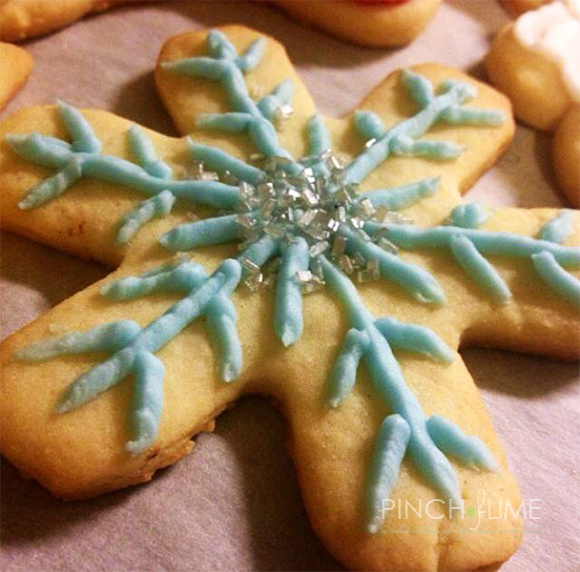 Because there were all those different Christmasy shapes, we thought we'd frost them, too. It's my go-to recipe for anything now and also the base for a few twists from the standard. Give them a try next time you're in the mood for some classic sugar cookies and you won't be disappointed. 1. In large bowl, cream together butter and sugar until fluffy. Beat in eggs and almond extract. 2. Mix flour, baking powder, and salt together in separate bowl. Add flour mixture to butter mixture, a little at a time and stirring after each addition, until all is incorporated. 3. Divide dough into two discs and wrap in plastic wrap. Chill for at least an hour or until firm. 5. On lightly floured surface, roll out dough to 1/8" thickness and cut into desired shapes. Place on baking sheet lined with parchment paper or lightly greased foil. 6. Bake for 7-8 minutes or until edges are golden brown. 7. If desired, decorate with frosting or icing. Recipes follow. 1. In a large bowl, cream the shortening to soften it. Add 2 c powdered sugar and beat with an electric mixer until smooth. 3. Mix milk and extract together and add half to the sugar mixture. Beat well. 4. Add remaining 2 c sugar and beat well. 5. Beat in remaining milk/extract and continue to beat until smooth and stiff. 6. If desired, color batches with food coloring. 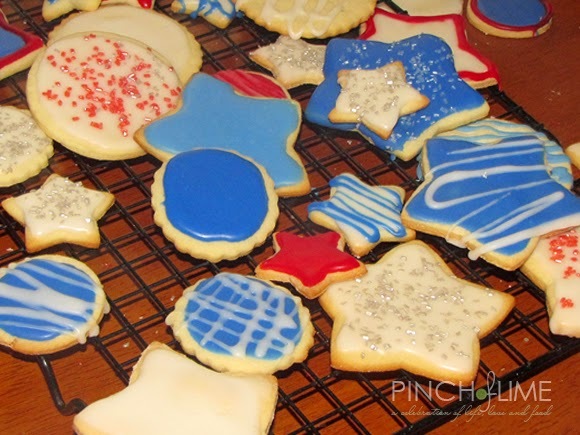 You may want to make extra batches of icing depending on how many cookies you'll frost. 1. Place milk and extract in bowl and add powdered sugar a little at a time until all is incorporated and smooth. 3. 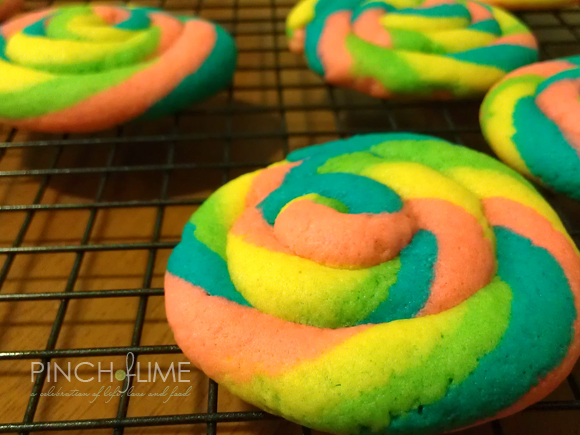 If desired, divide into batches and color with food coloring. 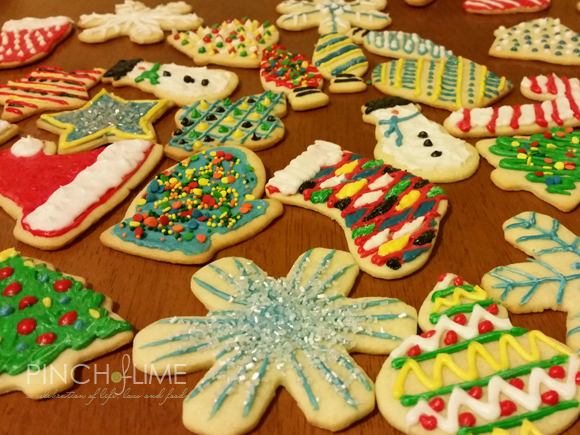 You may want to make extra batches of icing depending on how many cookies you'll ice.